Happy 2013! This may be the year of timely blogging… but I doubt it! 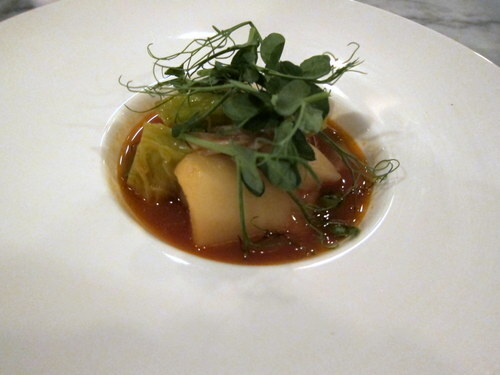 And in that same spirit, I give you a very, very, very delayed rundown of my last meal at Pumpkin. Pumpkin held a special post-Hurricane Sandy 3-for-$30 dinner. B was still stuck in town since all flights and trains continued to be cancelled, so we decided to all go out for a nice dinner. The power of twitter! 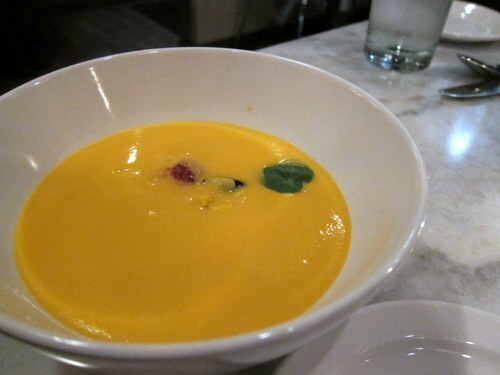 The sweet potato soup with honey miso and apple. This was unbelievable, and it was M’s favorite dish of the entire evening. Seriously Pumpkin, how do you do this? It’s a mild, yet distinct sweet potato taste, and incredibly creamy. You can also taste the very subtle honey miso and apple, and you just want it to never end. This is simply an incredible soup. Bottle this, and I’d drink it every day. I am a sweet potato freak, but I’m equally a scallop freak, so I opted for the barnegat light scallops as my first. These were 3 healthy sized seared scallops served with a zesty beet and lentil vinaigrette. Perfect. This was just perfect. I mean, if you like scallops. And if you like beets. And I love both. 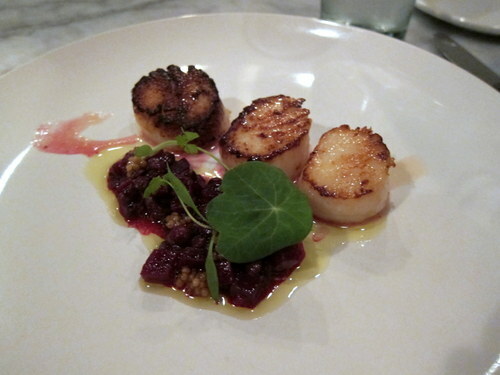 If you do not love scallops or beets… shame on you. They rule. I remembered the last time I had the duroc pork here, and how succulent it was, so both the boys got the duroc pork, two ways. There were slices of loin and also a pork belly. They both enjoyed this immensely. I don’t know whether it’s the duroc pork or how Pumpkin is preparing it, it’s probably a magical combination of both, but I will say it again. Pumpkin serves up some of the best pork I’ve ever had. I wanted to be different so I got the waluu spicy shellfish stew. Not too spicy, with a nice healthy helping of fish. The broth was super yummy. This was great, but honestly, the pork rules here. Heed my very humble recommendation. 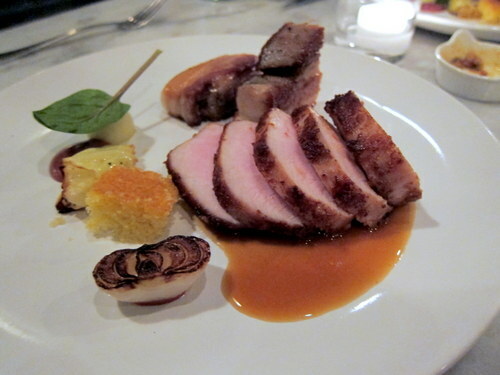 When at Pumpkin, order the duroc pork! 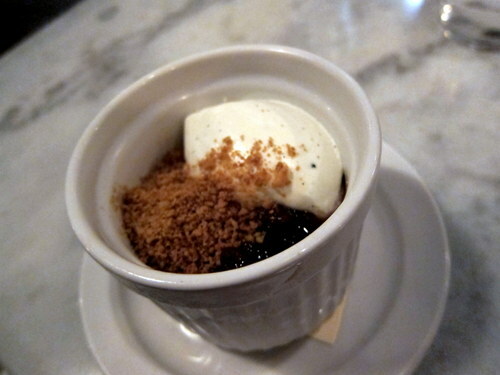 The boys got the butterscotch pudding with rum raisins and gingersnap. I swear they both practically stuck their faces into their ramekins and licked the insides clean. 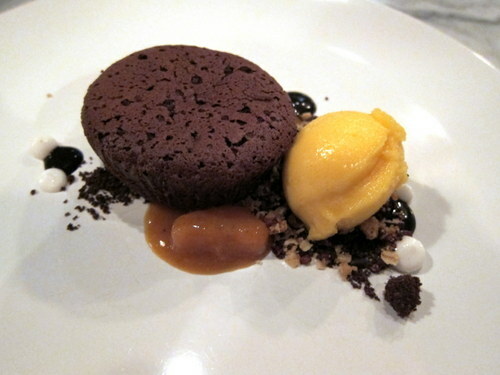 Once again I had to be different and got the chocolate cake with banana caramel and passion fruit sorbet. So chocolatey! And remember that I’m not all that into chocolate. So banana cramelly! And man alive, the passion fruit sorbet is uber concentrated and is like a thousand passion fruits punching you in the face. And you love these punches, every one. Service was great, as usual. Even when B tried to get a sample of the pumpkin gnocchi, and got denied because there just wasn’t any to spare, she did it so super nicely. I love me some Pumpkin. I’m so happy it’s literally the closest restaurant to my home. It was pretty cold in Niagara Falls, and when it gets cold, I want noodle soup. Yeah, I’m a little obsessed with udon. So I did a little research and found Taki. I didn’t have a car, so I walked. I wasn’t quite prepared for how long a walk it would be. And how unsavory some of the parts of town I’d have to walk through. In fact, walking through it was a bit depressing. But I digress… Eventually, I made it there. By golly, I made it there! And it was a good thing too because I was frickin starving. The place is dark and modern and seems to cater towards Japanese tourists. It actually is japanese-run and all the servers seem to speak japanese. This excited me. I had to wait a bit as they told me they had many groups already, and although there were many empty tables, they were a bit swamped. Apparently, due to the tour groups, you should really have a reservation. And for whatever reason, they weren’t letting anyone eat at the bar. Which was empty. Eventually, I did get a table. The sunomono was the first thing to come out. And man, was I glad it did. I waited an awful long time for this. Everyone around me was getting food, and I mean everyone. But I just sat. And waited and waited. Finally, food! This was very good. But why did it take so long to come out? Then I waited some more. And waited and waited. And eventually again, my sushi came out. 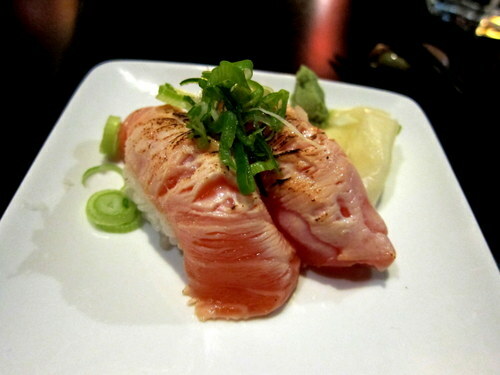 This was basically white salmon that was torched on one side. I’m sure there’s an official name for this, but I forgot to jot it down. So delicious! I mean, it would probably have been great without the torching, but man, there’s just something about that extra char bit that just makes it unbelievably delicious. I could eat all my sushi like this. Even though it was cold outside, with the extremely long walk and the coat I was wearing, I’d worked up quite a sweat. And the restaurant was also quite warm. So now, I wanted nothing to do with hot soup! 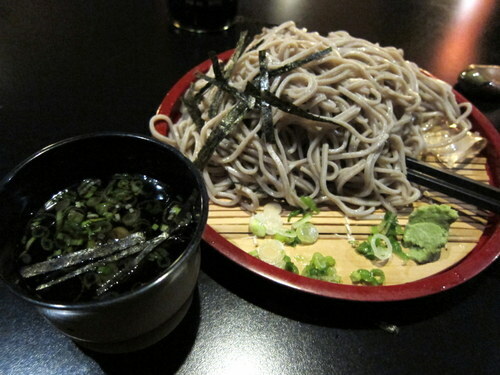 So instead, I got zaru soba. You take the cold soba noodles and you dip them into the also cold sauce. Sounds strange, I know, but this is delicious. I have fond memories from my childhood in Korea where I would eat plates and plates of this. 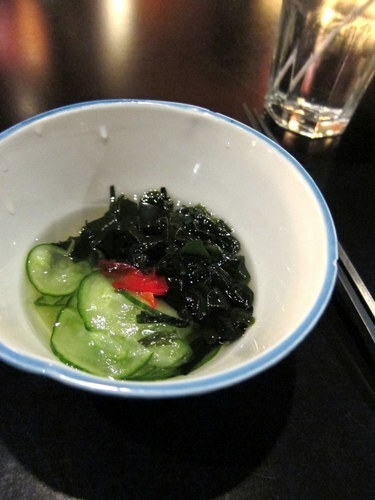 I would have loved it if they also provided some grated daikon with this, for the sauce, but hey, you can’t win em all. The food was excellent here. It was worth the walk. But I had to wait an unpleasantly long time for my food. They even noticed and apologized, luckily. When you’re in a tourist-driven town like this, it tends to be overrun with chain restaurants. 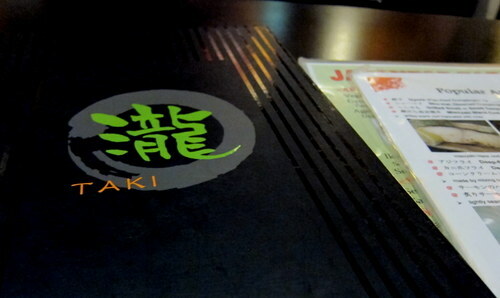 So you have to look a little and you’ll find an awesome japanese place like this. Sometimes work takes me to the randomest places. Like Niagara Falls. But on the Canadian side. I hadn’t been there since those junior high orchestra trips to Toronto. We stopped there both times for rides through the falls. Those are some fun memories. And at these randomest places, sometimes you have to stay across the street from a casino, because that’s where your conference is. So when it came time for dinners, I went across said street and ate. 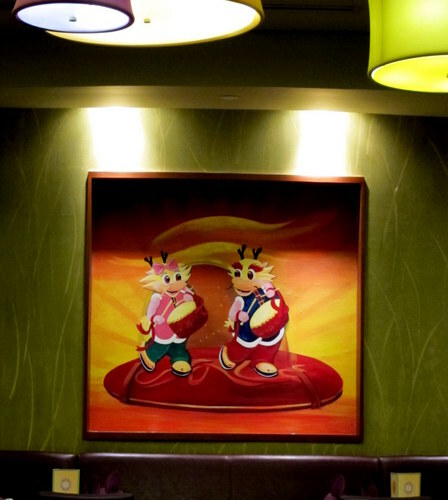 Golden Lotus is a chinese restaurant and buffet at the Fallsview Casino. I was in no physical position to eat my money’s worth at the buffet, so I just dined a la carte. This is a rather fancy place, so they actually have porcelain dinnerware. And tablecloths! 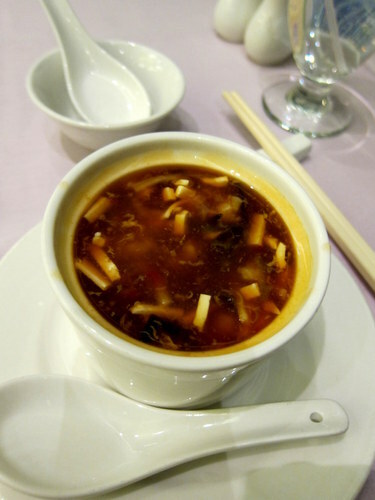 I got hot and sour soup. You know it’s my favorite of the chinese soups. This soup looked amazing! It was super duper hot. It was good, but not nearly as amazing as it looked. It just lacked a certain zest. But you could definitely taste fresh and high quality ingredients. I love dduk (korean rice cake) and I know that they have it at chinese restaurants sometimes, so I was happy to see it on the menu here. 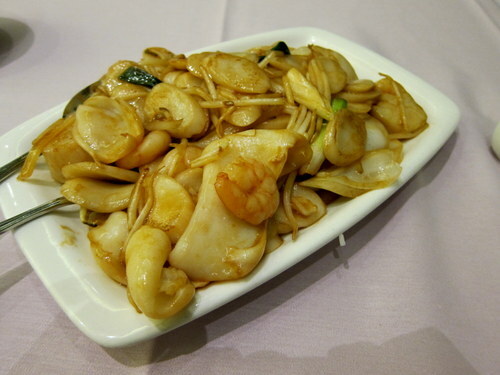 Here is the Seafood Shanghai Rice Cake. Basically, if I had ordered chow fun or ho fun or something, it would have been the same, except instead of a wide flat rice noodle, they used the rice cakes. Yum! The doughy and chewy and hot rice cakes were exactly what I wanted. There were tons of big scallops, shrimp, and squid to. The squid was a little bit funky for my liking (something I often experience when I try squid at chinese places, which doesn’t happen at other types of restaurants when I order it) but the rest of it was great. The other options around my hotel ran the gamut of not-so-amazing chain restaurants. For whatever reason, both the casino and Niagara Falls, in general, were rampant with Chinese tourists. And there were lots of them at this restaurant. So if there’s a chinese restaurant and there’s lots of chinese people dining there, I feel pretty safe with that decision.